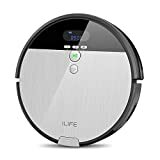 At its full retail price of $260, the ILIFE V8s Robotic Mop & Vacuum Cleaner is already an incredible value. It offers impressive performance on hard floors and low-pile carpet, plus a mopping feature typically reserved for much more expensive models. Right now, this great robot vacuum is on sale on Amazon for just $221. That’s an absolute steal… but we can still do better. Use the coupon code GJHNN6BG at checkout and you’ll get the V8s for just $192 and change. That’s the lowest price ever by a wide margin, and you only have until the end of the day tomorrow to take advantage. Updated pet hair care system with adjusting suction port and enhanced suction strength effectively improves the cleaning performance for picking up debris and hair. Better cleaning performance on hard floors. Innovated water tank provides a wet scrub auto spa for hard floors. Advanced i-dropping technology makes mopping more efficient and reliable. The robot cleaner stops releasing water when it stops for scrubbing and dirt pickup which prevents damages to the floor.